Welcome to my Part Two on How to start your own garden... Before I started to write this, I couldn't decide whether I should limit my post only to backyard gardening or if I should also include some advice for people with limited options, such as having only porch, patio, or balcony. I think the best solution would be to write a different post that will talk about container gardening on its own. If you would like to read my part one on how to start your seeds indoors, please click here. Now we are getting to the fun part - picking the right spot for your garden beds. If you would ask any gardener what is the most important thing about starting a garden, they would all tell you - Location, Location, Location... It will be the first thing that comes out of their mouth, no doubt! So step into your yard, look around, and evaluate your landscape. if you don't know it already, watch your yard during the day and see which spot gets the most sun. Most vegetables need 6 to 8 hours of sunlight in order to grow happily... A great spot would be anywhere on the south side of your house because that is where the sun shines the longest during the summer. Make sure you have no trees to cast a shadow on your garden. If you are picking your spot at a time when the trees have no leaves, you might be surprised in the summer! Take that into consideration! I also wouldn't place my garden beds next to a treated fence or any other place that could be hazardous to your plants or your health. Find a sunny, peaceful spot, with soil that has good potential and is somewhat rather larger than smaller if possible. That brings me to the next point - Don't overwhelm yourself right away. I said find a larger space, yes, but not because you will be right away planting a huge field the first year. You might actually want to start small and experiment. Over the years I learned that I needed way more space than I had at the time and that is when I started to expand. But I am glad that I started on the smaller scale. It was enough work for me at the time and it helped me learn anyway! If you pick a bigger area in your yard, it will also leave you some room for expanding your gardening area. If you start with two garden beds, you might dig up two more next year. We started with four beds and now we have six. Take a look at my garden 10 years ago. Doesn't it look so cute? I love that it was spacey and it left me lots of room to explore and experiment. But after having kids and learning more about natural living, we needed more gardening space. That brings me to my last point for today - Do not be afraid to go out of your comfort zone. You come out there and look around your yard and you are just not seeing it. You can't imagine to break up your space, dig up some squares and change your landscaping forever... But trust me when I tell you that if you use your imagination and go with it, you will not be disappointed. Have you ever heard the expression "Grow food, not lawns"? You will find yourself in the middle of this exact quote and it will look beautiful! 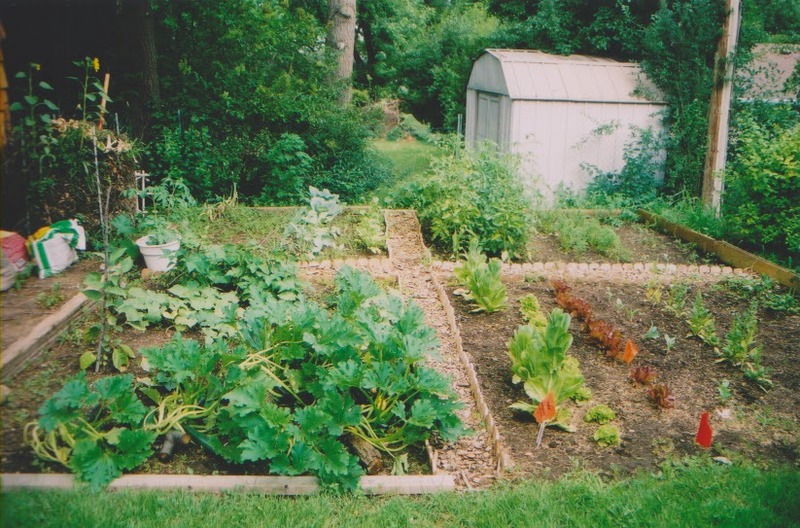 So go ahead and transform your yard into a little farm like we did and enjoy your food straight from the backyard. Here are couple pictures about how we expanded the four original garden beds. My husband is a genius and I am grateful that he knows what he is doing! Our garden beds originally hid behind the chicken coop but we decided to go out and break up our backyard. Here is the finished project - two extra garden beds with a cute fence around it so the animals don't damage our goodies. I will also later tell you how you can expand your growing space outside of your garden area and go all over your property. That is something we are in the process of doing right now. Please, come back for part three and if you have any questions, make sure you contact me in the comments bellow or at my Facebook Page.